Explain how the North and South were divided. New Orleans is a(n) _________ area. What effect did the climate and geography of the North have on its economy? It made it easy to grow cash crops on large plantations. It made growing cash crops on plantations difficult so people made money in factories instead. The region quickly became a hub for ski resorts and tech entrepreneurs. The hills protected the North from attack so their culture did not diffuse with other cultures. 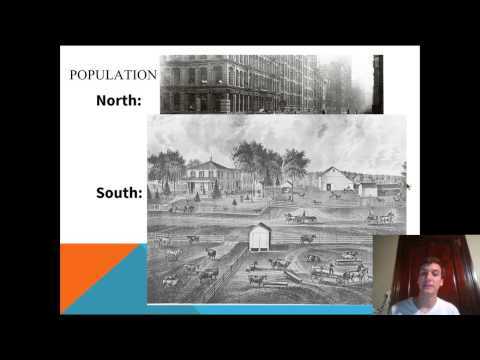 What effect did the geography of the SOUTH have on the development of its economy? It made people more likely to be subsistence farmers. It made it easy to grow cash crops on large farms called plantations. It forced people to open factories because there was no other way to make money. It cut them off from trading with any other cultures. Which vocabulary word is most closely associated with the ECONOMY of the North? Which of the following were effects of the invention of the cotton gin? Which of the following words best describes the population changes in the North? There were less people in the South so it was less ______ and more ________. Make sure you write down these push and pull factors in your notes! Where did most immigrants to the United States go, and why? Which one of the following is the best definition of the term 'famine'? There was a terrible war in in Ireland. What message did America send to the people that were immigrating? Americans only wanted rich, well educated people to immigrate. Americans wanted all people to come to our country and we welcomed everyone. The American Dream should only be available for a select few. What was the push factor that forced Marie to leave Germany? What pull factor made her want to come specifically to Philadelphia? Like many other European countries at the time. What push factor forced Breanna to leave her home country? What pull factor made her want to move to New York? What other technologies did the North have more of than the South that will become a big advantage when they fight in the Civil War? Which of the following best describes the differences between the North and the South as shown in these two pictures? Make sure you write these down in your notes! Which of the following was NOT a problem of the urbanized cities in the North? Where were there more railroads?